In our last post, we discussed the pros and cons of selecting a lighter hardwood color. This post will explore the many features of darker hardwoods, from stains and design elements to how they fare against day-to-day impacts and so much more. Choosing hardwood floors is an investment of both money and time. You’ll want to do due diligence on the type of wood you’d like to use (see our previous post for a list of wood types and their characteristics), then choose the stain that fits your décor and lifestyle. Read on for more details about darker hardwood flooring. 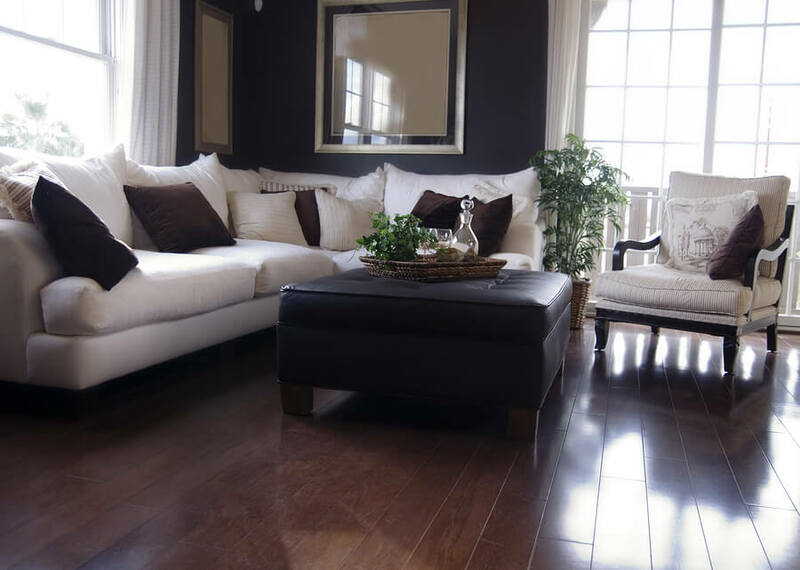 Dark hardwoods come from the same wood types as light hardwoods but are simply stained darker. As with lighter floors, dark hardwoods include a wide range of options. Here are some of the most popular offerings available, all with varying characteristics, tones, and other distinguishing features. Black/Ebony — One of the darkest shades, black creates a floor that almost appears to be painted. Very little grain shows through, meaning the flooring appears to be planks of all one, very dark color. Dark walnut — Like ebony, but a bit lighter, which shows the variations in the wood better and helps to minimize the appearance of dust or dirt. Espresso — A deep coffee brown, between a brown and a black. It shows some grains but tends more toward the black or ebony colors in terms of opacity. Royal mahogany — A darker stain with a touch of red. Golden oak — Adds a touch of gold to the nearly natural hue of light wood. Grey — More modern in color, grey offers a beachy vibe that shows off wood grains and stands up well to wear and tear. Mahogany — A redder color, mahogany provides great options for showing off wood grain or brightening a room, but may limit color patterns or clash with some home décor elements. Whitewash — This color lends itself to beachy styles or rustic chic, giving floors a white shade that holds up well to scratches, scrapes, general wear and tear, and dust buildup. It’s important to note that not all stain looks the same in all environments. A color that looks great at a store under certain lighting might look different once applied to your floors in your home. Be sure to test your chosen stain in a small area before applying it to your whole floor. An incorrect stain can be sanded off to allow for reapplication of the correct hue. As with all hardwoods, those stained a darker color require a seal coat to protect them from scraping, scratching, and everyday wear and tear. They tend to mask ordinary staining from food or beverages better, but darker hardwoods tend to show scrapes and scratch marks easier. This is because the gouges typically go through the stained color and into the undyed, much lighter wood. Such damage can be avoided by taking a few steps, as mentioned in our previous post. Limit wearing heels to rooms that do not have hardwoods. Trim pets’ nails and clean up spills as soon as possible. Lay rugs in high-traffic areas to minimize wearing. Put up curtains to mitigate sun damage, and add pads to furniture feet to avoid scratching. If you’re still concerned, use an extra layer or more durable seal coat to add additional protection, and be sure to refinish or re-coat your hardwood floors regularly to ensure that the layer stays strong. The darker the elements in a space, the less spacious that room feels. This means that darker hardwoods, especially those that are very dark, work best in very large rooms. They also work in open-concept designs, and with both traditional and modern aesthetics. Also, a lighter or reddish dark tends to fit the more traditional design, particularly if one can see the wood’s graining through the stain, whereas a more one-dimensional look, with less graining, fits in with more modern looks. The most important element of floor staining is that you and your family are happy with the color and how it works in your home. Design professionals can steer you in the right direction, should you be completely unsure what will work best, but the last thing you want is to invest the time and money necessary to purchase, install, and stain your floors only to find that the color isn’t for you. 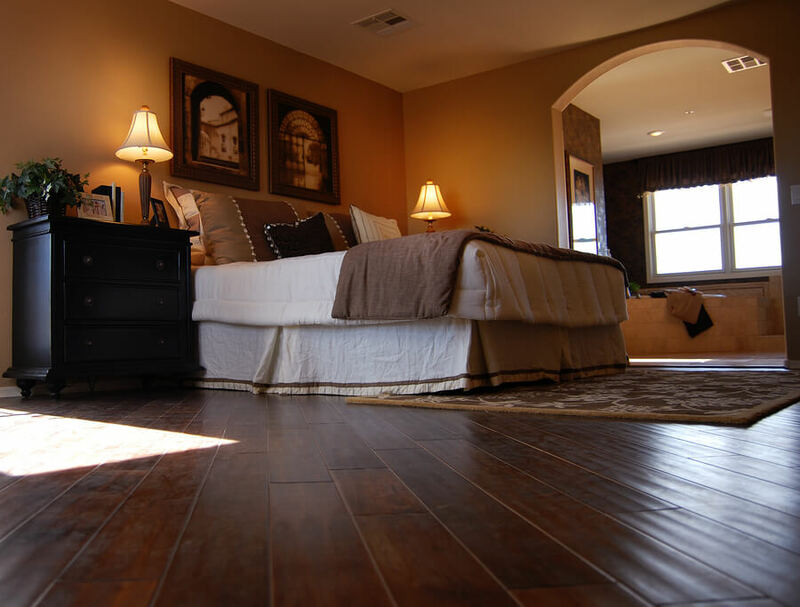 Do You Have Concerns About Selecting Dark Hardwoods? Your local flooring expert, District Floor Depot, is here to address any questions you might have about the process of selecting a dark hardwood floor variety. We’re here to help you decide on the tone that best fits your design aesthetic and your lifestyle, as well as provide additional information about caring for hardwoods. Let’s discuss today.